The latest works of artist Lee Wan, who will represent the Korean Pavilion at the 2017 Venice Biennale, looks profound, as if succeeding the spirit of "Dansaekhwa," the Korean monochrome painting. Abstract lines are scribbled on a canvas painted in a single color. However, Lee, 38, said the paintings ― on display at the 313 Art Project in Seongbuk-dong, Seoul ― are simply meaningless to him. The background was colored by day laborers, hired and paid by the artist. "I hired the laborers through employment agencies. I gave the tiny size 1 brushes to them and instructed them to fill the whole 162-centimeter-long and 130-centimeter-wide canvas," Lee explained. For "A Diligent Attitude Towards a Meaningless Thing" series, Lee hired eight workers ― four male and four female ― and paid them 8,000 won per hour. The laborers were from Korea, Mongolia, Uzbekistan and Cambodia, ranging from their 20s to 60s. Their original occupations include job applicant, housekeeper, day laborer, immigrant worker and retiree. They worked for five days, seven hours on average per day. A video documenting Lee giving instructions to the day laborers and the laborers painting the canvas is played alongside the paintings. On the colored canvas, the artist made a brush stroke magnifying a meaningless scribble created to check if a pen is working or not. "They worked very diligently, without any curiosity. They told me what they do as part time is mostly meaningless. The act of painting the canvas was meaningless for them and my brushstrokes are meaningless as well," Lee said. "This is just the trace of the exchange of labor and money." "Through the series, Lee warns that in the near future that no one but consumers and laborers will exist as this is the advent of a systematized and de-individualized world," a gallery official explained. The 313 Art Project recently moved from the luxurious neighborhood of Sinsa-dong, southern Seoul, to a private house-turned-gallery in a residential area in Seongbuk-dong, northern Seoul. 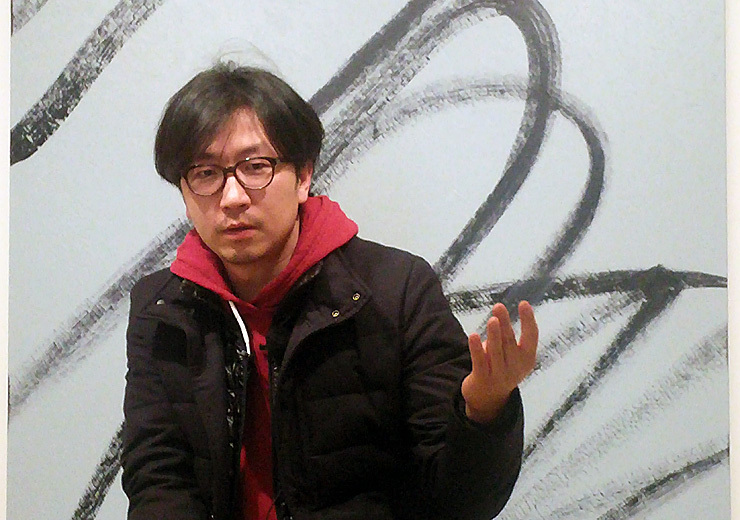 Lee's solo exhibition is the first in the "Seongbuk-dong Project," a series of exhibitions representing the gallery's role. Lee shipped his works to be displayed at the Venice Biennale right ahead of the opening of his solo exhibition. Selected by the 2017 Korean Pavilion's curator Lee Dae-hyung, Lee will represent Korea at the largest contemporary art event in the world along with Cody Choi, 56, and the fictional character Mr. K, representing an ordinary Korean man born in the 1930s under Japanese colonial rule. Lee said Mr. K was brought into the world in the Hwanghak-dong Flea Market in 2012. "I collect old artifacts and discovered a wooden case adorned with mother-of-pearl at the market. The box was full of photos of the lifetime of a man born in the 1930s, grew up with the independence of Korea and lived through the Syngman Rhee and the Park Chung-hee administrations. He is the first generation of modernization in Korea and fantasized about Western modernity," Lee said. The Korean Pavilion will be displayed like a flea market as the artist attempts to convey the complexity of Korean society. "It will be artistic as well as social and historic in terms of the collection," the artist said. Lee will also present the "Made in" series, which shot him to stardom. He visited 12 countries in Asia and documented the process of making breakfast from food ingredients to tableware, questioning the significance of labor in the era of division. Two of the videos are on display at the 313 Art Project as well ― "Made in China," which shows the artist making a pair of chopstick in China, and "Made in Taiwan," producing sugar in Taiwan. Lee's solo exhibit runs through March 10. Admission is free. For more information, visit www.313artproject.com or call 02-3446-3137.